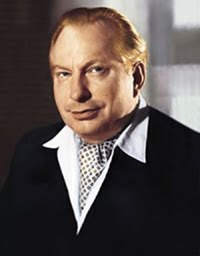 Today would have been the 100th birthday of Scientology founder, L. Ron Hubbard, had he not died in 1986. Or did he? Scientology's new ad campaign touts immortality. "You are a spirit. You are your own soul. You are not mortal. You can be free. You have been invited." In Hubbard's honor, I'm inviting you to try a recipe from everyone's favorite sofa-jumping Scientologist. It was published in his friend, Paul Newman's cookbook and calls for 1/2 a cup of garlic. Heat the oil in a large saucepan until hot. Add the garlic and capers, then carefully add the parsley. Stand back because the oil may spatter. Add the tomatoes, lemon juice, wine, pepper flakes, salt, and black pepper. Cook, stirring occasionally, for 15 minutes. Bring a large pot of salted water to a boil. Add the linguine and cook according to the package directions until firm but tender. While the pasta is cooking, steam the clams. Place the clams in another large pot with the garlic, wine, and vegetable broth. Cover and bring to a boil over high heat, shaking the pot, until all the shells are open. Leaving the open clams in the pot, drain off all but 1/4 cup of the steaming liquid and stir it into the tomato sauce. Cover the clams and keep warm while preparing the rest of the dish. Drain the linguine and add to the tomato sauce. Cook over high heat for about 4 minutes to heat through. Divide the pasta among 6 heated bowls. 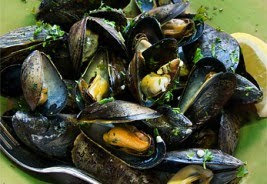 Top each serving with 5 clams and garnish with the remaining parsley. 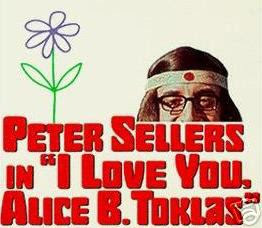 Yesterday, I missed the opportunity to honor the passing of the great Alice B. Toklas on March 7, 1967, but I'm making up for it today. Toklas is best-known as the steely partner of Gertrude Stein and the unwitting publisher of their friend Brion Gysin’s recipe for “Haschich” fudge. Alas, Toklas did not know that the ingredient “canibis satvia” was marijuana. In all fairness, my absence of a date-appropriate post on Toklas was not for want of trying. Toklas also published a recipe for Garlic Ice Cream, a frozen dressing for salad. The recipe calls for 2 spoons of “Cowboy’s Delight” and no amount of searching could help me determine what that is. Two helpful Chowhound sleuths offered clues: it was available by mail order from the Old Smoky Sales Co. in Los Angeles and it’s a common name for the plant, prairie mallow. Unfortunately, these didn’t help me with the recipe, so if anyone has any hints, please let me know. The picture above is from a 1968 movie in which a “square” Peter Sellars decides to “drop out” and become a hippie after tasting “groovy” brownies. So without further ado, recipes for garlic ice cream and hash brownies from The Alice B. Toklas Cookbook, published in 1954. Proceed at your own risk. Beat until ingredients are well mixed. Freeze. Do not stir while freezing. Take 1 teaspoon black peppercorns, 1 whole nutmeg, 4 average sticks of cinnamon, 1 teaspoon coriander. These should all be pulverized in a mortar. About a handful each of de-stoned dates, dried figs, shelled almonds and peanuts: chop these and mix them together. A bunch of cannabis sativa can be pulverized. This along with the spices should be dusted over the mixed fruit and nuts, kneaded together. About a cup of sugar dissolved in a big pat of butter. Rolled into a cake and cut into pieces or made into balls about the size of a walnut, it should be eaten with care. Two pieces are quite sufficient. Bear with me on this post as its a bit of a stretch but it has, I hope, some interesting information and a super-easy and delicious salsa recipe. Garlic is rich in sulfuric compounds which is part of the reason it lowers blood pressure and cholesterol levels and boosts immunity. When preparing garlic, mash it and let it sit for 10 to 15 minutes to allow the sulfur compounds to form completely. 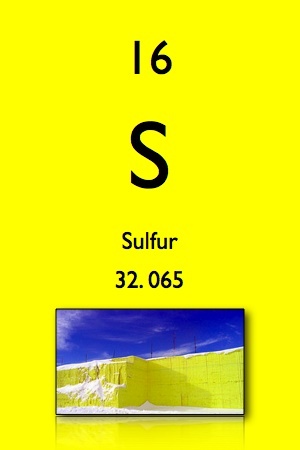 Sulfur is referred to in the bible as brimstone and the term “fire and brimstone” was used to express god’s wrath. My sister’s boyfriend has asked me for Rick Bayless’s salsa recipe. Since it calls for fire-roasted tomatoes and roasted garlic, I’m rechristening it “Fire and Brimstone Salsa” in honor of Comrade Mendeleev. Roast the chiles and garlic. In a small ungreased skillet over medium heat, roast the chiles and garlic, turning regularly, until they are soft and blotchy brown, about 10 minutes for the chiles, 15 minutes for the garlic. Cool until handleable, then pull the stem(s) off the chile(s) and roughly chop. Peel the skin off the garlic. Scoop into a food processor and pulse until quite finely chopped. Finish the salsa. Add the tomatoes with their juice. Re-cover and pulse until you have a coarse puree. Scrape into a serving dish. Stir in the cilantro and lime juice. Taste and season with salt, usually about 1/2 teaspoon. You’re ready to serve.